Bylakuppe, Karnataka, India, December 21, 2017 – When His Holiness the Dalai Lama arrived at Sera-Mey Monastery early this morning he was received by the Abbot, the Ganden Throne-holder, the former Ganden Throne-holder, the Shartse and Jangtse hierarchs, and the Sikyong. A couple of bright Tibetan children in traditional costume were also waiting with a bowl of milk and a box of grain and tsampa to offer a traditional welcome. His Holiness took a pinch of tsampa, dipped his finger in the milk, teased the children and laughed in warm appreciation. At the entrance to the new Debate Courtyard and Science Centre he cut the ribbon and recited verses while tossing grain in the air to invoke auspiciousness. At that back of the daïs at the head of the yard he lit the central wick of a large butter lamp and took his seat on the throne. One of the chief guests, Jagadguru Sri Shivarathri http://jssonline.org/jss/mahaswamiji/, offered His Holiness a shawl, a garland and a turban. He expressed his appreciation of the way Tibetans have kept ancient Indian knowledge alive and admired their use of reason and logic in debate. He was followed by Khenpo Sonam Tenphel, Speaker of the Tibetan Parliament in Exile, who praised the far-sighted vision in the steps His Holiness had taken in exile to preserve Tibet’s language and culture. This vision was amply supported by the Government of India, as well as the government of states such as Karnataka. Sikyong Lobsang Sangay greeted his fellow guests. He recalled the start of the settlements in 1963, the establishment of the great monasteries in 1974, as well as the expansion in 1989 and the rebuilding of the Sera-Mey assembly hall in 2002. He noted that the opening of this debate courtyard was the next stage in a steady process of development. In his speech in Tibetan he also noted that it is now ten years since the monastery had to resolve the dispute concerning Dolgyal http://www.sangye.it/wordpress2/?cat=95. He congratulated the monastic authorities on the way they took His Holiness’s considered advice to heart and organized a peaceable separation of the majority of the monks from those who were reluctant to forego the practice. The audience was avid in its applause. He added that His Holiness encourages harmonious relations among all religious traditions. Sri Sri Sri Nirmalanandanatha Swamiji https://en.wikipedia.org/wiki/Nirmalananda_Swamiji spoke in praise of His Holiness’s edifying leadership. He mentioned how inspiring it was to see so many monks gathered together. His Holiness acknowledged the various distinguished guests and thanked the previous speakers for sharing their views. He recognized that Indian understanding of the workings of the mind and emotions that has grown from experience of the practices of concentration and insight, shamatha and vipashyana, preceded the appearance of the Buddha. In fact, the Buddha was participating in those traditions when he determined to sit and meditate under the Bodhi Tree. His Holiness reminded the audience of his admiration for the religious harmony that prevails in India, which he regards as an example for others to follow, adding that he considers himself a messenger of ancient Indian wisdom. He pointed out that the Buddha’s advice to be skeptical, to accept what he had to say only after properly examining and analyzing it, was unique. The key to expanding our knowledge, he said, is to employ our human intelligence to the full. “The Sera-Mey Abbot asked me to give a major teaching on this occasion,” His Holiness explained. “But I told him that, because I’m having to be more careful about making myself tired, I would teach Je Tsongkhapa’s ‘In Praise of Dependent Origination’http://www.sangye.it/altro/?p=1078. “In his first teaching the Buddha explained the Four Noble Truths http://www.sangye.it/altro/?p=5703, as is recorded in the Pali tradition. During the second turning of the wheel of dharma, he taught the Perfection of Wisdom, which we find recorded in the Sanskrit tradition. This text, ‘In Praise of Dependent Origination,’ http://www.sangye.it/altro/?p=1078 praises the Buddha for his use of reasoning and for explaining emptiness in the context of dependent arising. Because things exist in dependence on other factors, they are empty of intrinsic existence. Dependence reveals relativity: things can only be posited in dependence on other factors. “There are several sets of reasoning that support this, among them the Diamond Slivers, and the examination of identity that is ‘neither one nor many’. The reasoning of dependent origination avoids the extremes of nihilism and permanence. When Nagarjuna refers to things that are dependently arisen as merely designated he is indicating the Middle Way View. This is what you find when you read his work, ‘Fundamental Wisdom of the Middle Way’ http://www.sangye.it/altro/?p=513, which shows how things are empty of intrinsic existence. 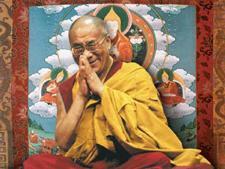 His Holiness read steadily through the text, elucidating his reading with explanatory remarks. He encouraged those who wish to know more to read Chapters 18 and 24 for Nagarjuna’s ‘Fundamental Wisdom’ http://www.sangye.it/altro/?p=513. 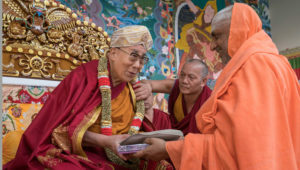 He also commended his ‘Seventy Verses on Emptiness’ http://www.sangye.it/altro/?p=1108 and ‘Sixty Verses on Reasoning’ http://www.sangye.it/altro/?p=1073. When he reached the end, His Holiness remarked that as a boy he had been able to memorize this text in a single morning and now he urges others to memorize and recite it too. His Holiness was requested to release a new edition of Nagarjuna’s ‘Fundamental Wisdom’ http://www.sangye.it/altro/?p=513 and a commentary to it in Tibetan published by Sera-Mey Monastery. He thanked everyone who had attended the inauguration and teaching for coming. Expressing admiration for the way the monastery’s monks are committed to their studies, he suggested that there is no reason why lay people shouldn’t study too. Buddhism is not only about faith, but involves reaching an understanding, which requires that we use our intelligence. The occasion concluded with the recitation of a ‘Prayer for the Flourishing of the Buddha’s Teachings’ http://www.sangye.it/wordpress2/?p=2153 composed by His Holiness, after which guests were invited to lunch.